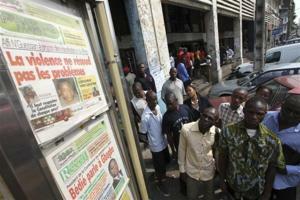 People look at the newspapers displayed in the business area of Abidjan December 21, 2010 as life progressively turns to normal after the violence of last week. The message on the front page of newspaper at top left reads,”Violence does not resolve the problems”. Over a hundred and fifty people were killed in the West African country this December after a disputed presidential election in October between the incumbent Laurent Gbagbo and his rival Alassane Ouattara. Caritas says dialogue must be supported otherwise the conflict could turn into a major humanitarian crisis that goes beyond the borders of Côte d’Ivoire. Jean Djoman says mediation from the Economic Community of West African States (ECOWAS) is working. A civil war in Côte d’Ivoire from 2002 to 2004 left thousands dead and forced many more from their homes. In cooperation with other aid organisations, Caritas has been helping more than 2,600 internally displaced people in Duekoué and Danané in the west of the country over the last weeks. Most of them are villagers from regions occupied by movements in favour of Laurent Gbagbo. Among the displaced are also children with moderate or severe malnutrition needing specific assistance. “At the moment, we are able to meet these needs in terms of food, water, sanitation and health. But the stocks from our contingency plan established before the election only allow us to continue for another month at the most. We are now considering further actions with our international partners from the Caritas Internationalis network”, said Mr. Djoman. Caritas is present throughout the region with its local Caritas organisations and through programmes of international Caritas members. Catholic Relief Services (CRS), an American Caritas member organisation, has for example programmes in the five border countries of Côte d’Ivoire. “If the situation should explode, then it would cause a crisis at the regional level. We need to do everything we can to find a peaceful solution to this conflict,” Mr. Djoman said.”At the same time, we as NGO also need to prepare for the worst case scenario”.